Migraines and related health problems affect millions of people every day. My friend Stephanie Weaver, a food blogger, wellness coach and public health expert, came up with the Migraine Relief Plan, a brilliant plan to ease the pain of migraine sufferers. This amazing plan starts by identifying and experimenting with certain “food triggers” that directly cause or intensify headache symptoms. When you adapt her plan to your specific needs, it lays out a clear path to better health and fewer migraines. 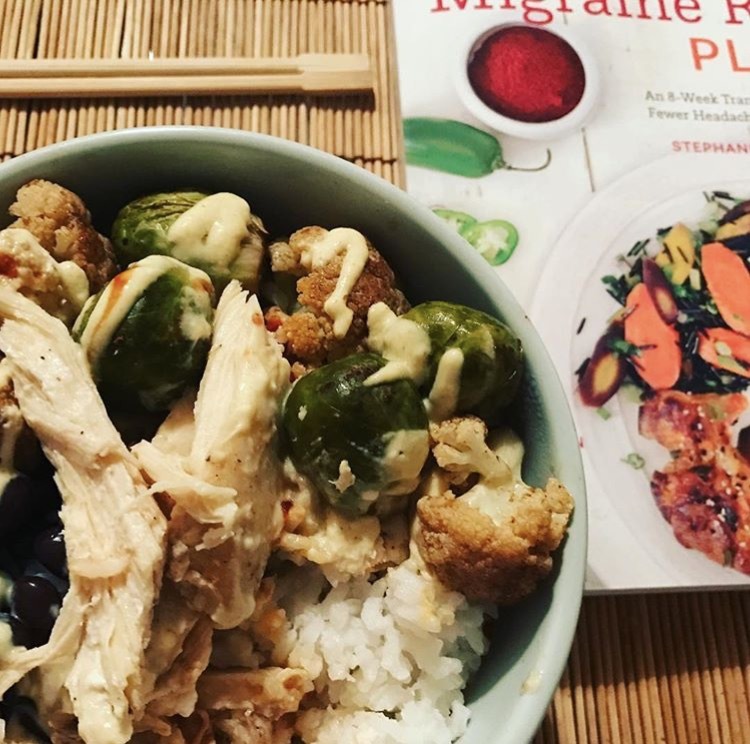 Although as a food blogger, I was focusing on the cookbook section of this book and all of the relatively easy and fun recipes, the book is really a multi-pronged guide to help migraine sufferers reduce their symptoms and eventually lead a healthier life. It’s not just a cookbook; it’s a plan to eat healthy and be healthier. I loved the trigger-free and super-easy recipes like the rice bowl … we’ve all made something similar, right? Use up your leftover cooked rice and chicken as well as any fresh veggies you have on hand, and top it with the easy-to-make smoky mustard sauce, and you have a super-easy and healthy dinner, perfect for a busy weeknight. You can’t beat an easy, quick recipe that also keeps you healthy; and every recipe in this book is low-sodium, gluten-free, and sugar-free … and can be adapted to a vegan or vegetarian diet. Like the fish in parchment paper. This is probably one of my favorite things to make and eat – I really love how the parchment paper keeps the fish nice and juicy while making sure it gets cooked all the way. If you’re not a person who cooks fish very often because of the unease of making sure the fish is cooked thoroughly without it being dry, this is for you. 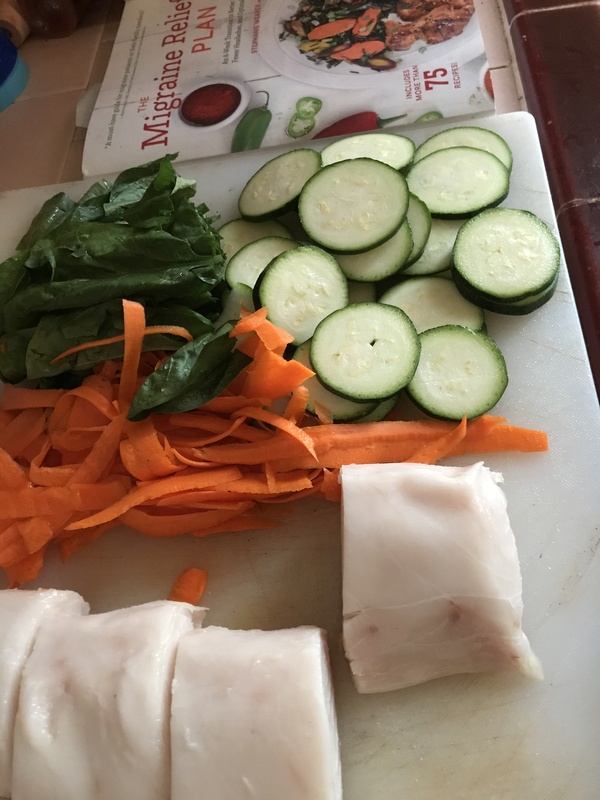 You simply slice veggies (the recipe calls for carrot, spinach, zucchini and bell pepper), wrap the vegetables and fish inside parchment paper, and bake. Recently I started a ketogenic diet, and I got a whole bunch of delicious fresh-caught tuna from my friends at Catalina Offshore Seafood Products. 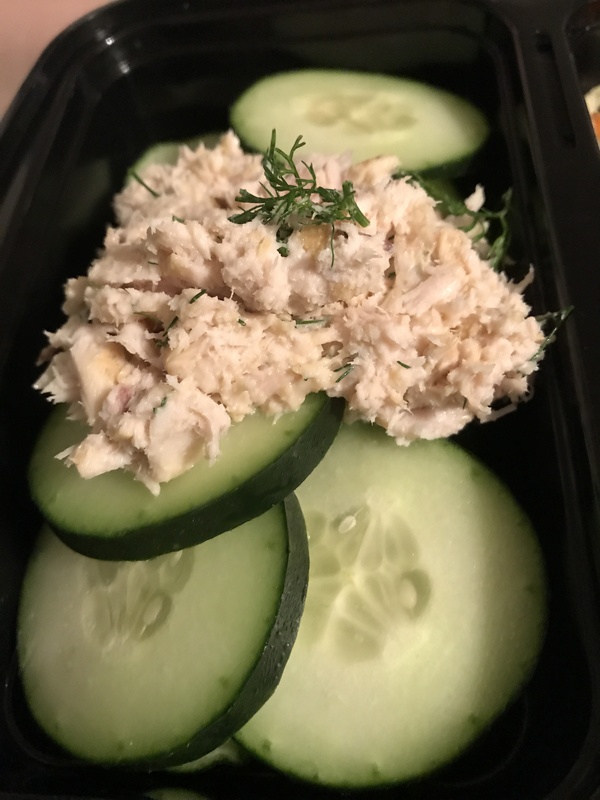 Tuna salad to the rescue! This is a super-easy, keto-friendly, paleo-friendly, and really delicious meal. You can make it into a sandwich (if you’re not keto or paleo) or just serve it over a bed of greens or cucumber. I even made my tuna salad ahead of time and used mine for workday lunches. Anybody can write a cookbook, but I love how this book creates a full plan for better health.